Single Sign On (SSO) with SAML on Legalesign Esignature. You can now access Legalesign by Single Sign On (SSO) with the widely used SAML standard. Adopting SSO and SAML are an excellent way to improve your organisation's security while also simplifying life for your staff. If you use some widely adopted work apps, like Google Apps for Work, then you already have SSO and SAML ready to go. Single Sign On simplifies your user administration by centralising all your logins. Your employees login with the same password and access point to all your organisation’s software assets, while you gain the power to grant and revoke access to all your software from a single location. Security Assertion Markup Language (SAML) is one of several formats available that can be thought of as open authentication systems. 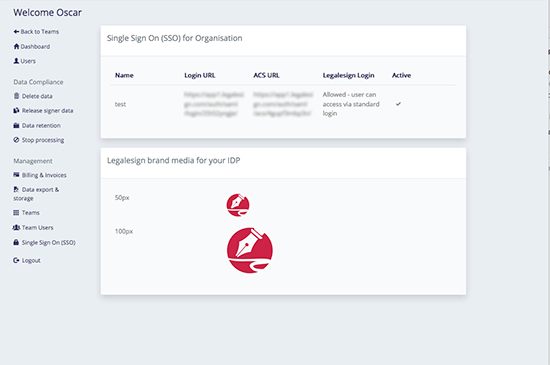 Software providers like Legalesign can enable their app for SAML authentication and thereby enable connections from any identity provider who offer SAML . SAML is available in many identity providers and common business applications, including Google Apps for Work, Okta, OneLogin, Microsoft Azure and many more. Search online for ‘SAML identity providers’ for more information. If your company uses any SAML identity provider, you can now use that to login to Legalesign. To get started you simply need to send us your SAML metadata, let us know if you want to retain an access point from Legalesign, and whether you want to block access from Legalesign’s main login. We’ll do the rest. You can inspect your SSO credentials from the GDRP/Organisations section of the Legalesign. We’ll produce an article soon about how to find your SAML metadata in Google Apps for work, but in the meantime you can find more information in this article. Here is the Legalesign SSO control within your GDPR/Organisation control panel.